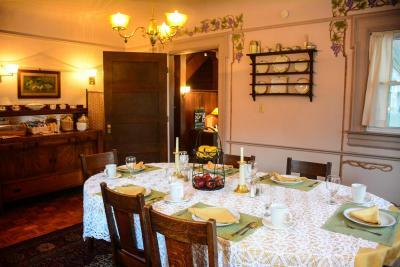 Lock in a great price for Stone Soup Inn – rated 9 by recent guests! 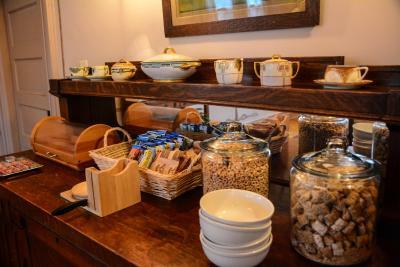 Wonderful homemade breakfasts served on the weekend. Within walking distance to great places to eat. Lovely neighborhood! Staff took personal interest in me. Carried luggage for me. It is very homey, very historic, all around a great place! My friend and I stayed for 1 night and would said it was better than staying at a hotel. They also have a snack bar which is free and awesome breakfast! We had homemade quiche with fresh fruits during our stay and my friend and I were very satisfied. Breakfast was wonderful! Because of the age of the home, it was difficult to find plug ins for hair dryer/phone - and the TV had difficulty working. But, it was a clean room, nice atmosphere and free snacks and soda! 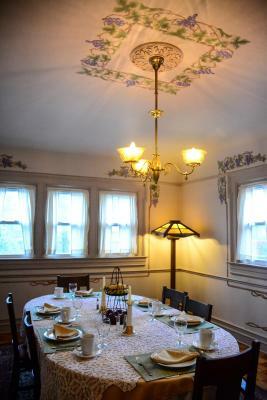 The house and rooms were beautifully restored and there was a lot to look at while there. The parking was easy to find and secure. The staff were very friendly & the breakfast was very good. The staff that checked us in was top notch. We were in a little bit of s rush to get to our dinner resevation and they were incredibly accommodating. Everything was so positive about our stay. Quaint but all the accoutrements. Area felt safe. Staff went out of their way to make our stay special. It was like our own little apartment. Like we were in a tiny house. My son loved it. Stone Soup Inn This rating is a reflection of how the property compares to the industry standard when it comes to price, facilities and services available. It's based on a self-evaluation by the property. Use this rating to help choose your stay! Indiana University-Purdue University at Indianapolis is within 3 miles of the Stone Soup Inn. The Morris-Butler House Museum is within a 5-minute walk of the guest house. 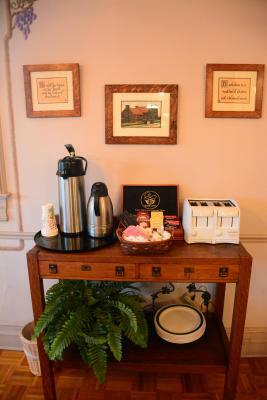 When would you like to stay at Stone Soup Inn? 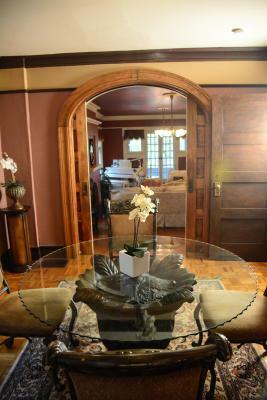 Filled with exquisite Victorian-era antiques including a beautifully carved six foot high headboard, and decorative fireplace. Our most romantic room on those cold winter nights. Full-size bed & steam shower. Tucked into the garden with it's own private lower level entrance, the Garden Studio offers a tranquil seclusion as well as a private bath. A heavenly queen bed, kitchen, desk and bistro table make this a serene escape for business or pleasure. Our Most Popular Room, this room features a sleigh bed, carved teak wood and a large bay window overlooking our lily pond; a perfect retreat for a romantic getaway. The Innkeeper's favorite, completely furnished with Mission-style antiques, Arts & Crafts stenciling and a welcoming bay window seat. Queen-size bed and shared bath. This room was the original servants quarters to the house. 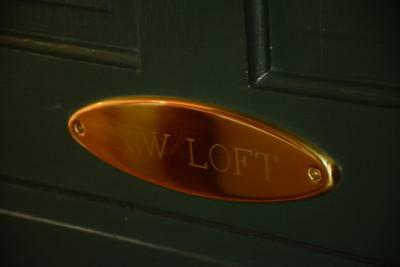 It is the largest of the lofts and decorated in a eye-pleasing rustic style. 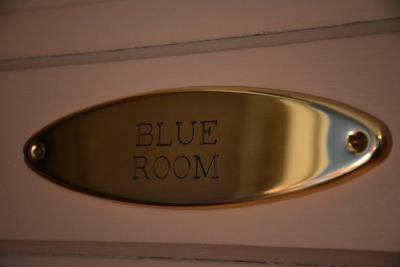 The room has a queen size bed and a bathroom with a Jacuzzi tub. This fully furnished apartment suite has a large sleeping loft overlooking a common area. 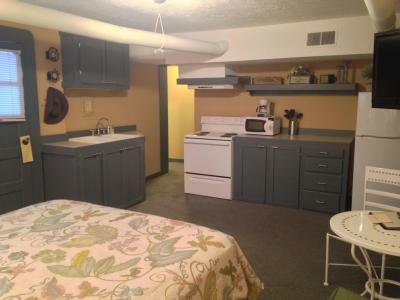 The spacious room includes laundry facilities, digital cable and a full kitchen. 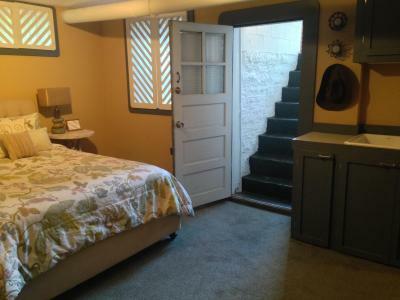 Complete with small kitchen, double bed and private bathroom, this room has all the comforts of home. This room does not include phone or voicemail services. Painted in a High Victorian-style, this unique room will take you back to a more elegant time. Lace curtains and a decorative fireplace complete the ambiance. Guests can experience the feel of sleeping in the clouds while resting on our very comfortable Queen-size bed. This room also features a private bathroom with a two-person Jacuzzi. 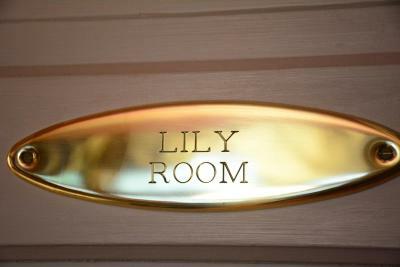 Inspired by the Innkeeper's visit to France, this room is decorated in a bright European style. In addition to the Queen-size bed, there is plenty of room to stretch out on the couch watch TV and relax. We look to welcome new visitors to our city and have created a warm, friendly environment - a home away from home - where travelers can relax by a fire, share their experiences and sleep in comfort. 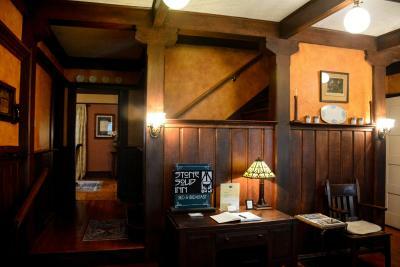 Located in the heart of the historic Old Northside, the Stone Soup Inn offers all the beauty and comfort of an upscale turn of the century home. After stepping into the large foyer, relax by the baby grand piano in the living room or cuddle up with a good book in our library. 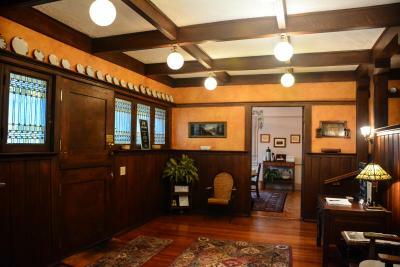 All of these rooms contain beautifully detailed woodwork and hardwood floors. 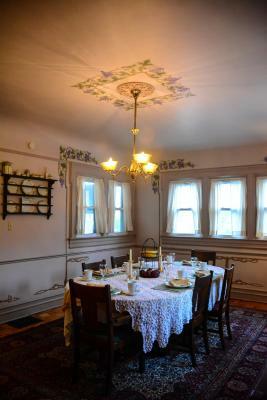 Breakfast will be served in our distinctive dining room or, weather permitting, on the large, wraparound porch. On the second floor, share stories with other guests in the sitting room or outside on the spacious balcony overlooking the front garden and Lilly pond. 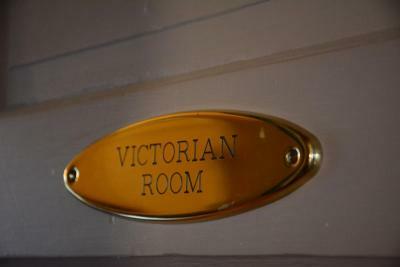 Decorated with a combination of Mission-style and Victorian-era antiques, guests will find a comfortable, convenient place to stay as they explore nearby historic sites and downtown attractions. 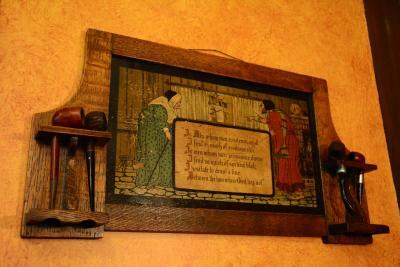 House Rules Stone Soup Inn takes special requests – add in the next step! Stone Soup Inn accepts these cards and reserves the right to temporarily hold an amount prior to arrival. The bathroom needed more attention when cleaning. The breakfast choices could have been better. We were expecting a hot breakfast, not just cereal bagels and fruit. Parking could also be better. Shower water temp variable during use. Parking was scarce, although I did squeeze in a spot in the lot. The shared bathroom didn't go so well regarding availability in the morning. Great breakfast and inn! Innkeeper provided us everything we needed to stay warm and sound in Indianapolis. The tradition and age the inn has provides its unique atmosphere. We felt more than comfortable and welcomed. I prefer having a bathroom and shower in the room rather than sharing with other guests. .